Last year, Hollywood released a gem of a movie entitled The Help; a film based on an equally popular book. The film featured several intertwined stories, but the central focus was on a terribly dark portion of our nation’s history. Deep in the heart of Jim Crow Mississippi, a young white woman sets out to begin a writing career, but her discomfort with the current state of racial affairs prompts her to write a book—incognito—about the lives of 12 maids working in Jackson. Throughout the course of the movie the audience is subjected to several examples of the hardships African Americans faced in a pre-Civil Rights America. They may have been freed from slavery nearly 100 years earlier, but racism and bigotry—primarily and most offensively in the deep south—afforded them an incredibly restrictive life. From one character who pushes a state bill to require separate toilets in homes that hired black help, to the shooting of a civil rights activist, movie-goers were subjected to living just a few of the horrors that African Americans faced in an era gone by. In the days following the George Zimmerman verdict, we’ve heard from many African Americans who maintain that their lives are no different than those depicted in The Help. Even Attorney General Eric Holder, an African American himself, spoke to the NAACP convention this past week and relayed that he had to sit his teenage son down and talk to him about the perils of being an African American teen in this country today. The truth is . . . there is indeed reason for African Americans to fear. In other words, nearly 50% of all murder victims in this country are African American. According to another study put forth by the same government institution, a shocking 93% of black homicide victims . . . were murdered by a black perpetrator. In other words, as an African American in this country, you are far more likely to be murdered by another African American than anyone else. Immediately following the Zimmerman verdict, many commentators, activists, movie stars, singers, and politicians came out swinging, insinuating that this was indeed the result of a country still mired in the mud of racial intolerance not unlike that portrayed in The Help. These are numbers. Numbers are devoid of feeling; of belief; of political party . . . numbers are unchangeable. They are, in fact, what they are. So why is it that so many across this country—and undoubtedly across the world—are convinced that the above-mentioned numbers are reversed? That instead, the 90% of interracial crimes committed, are committed by whites? Simply put, very influential men and women like the Reverend Al Sharpton, Jesse Jackson, Attorney General Eric Holder, many from the NAACP, among many others, refuse to move on from what was, indeed, a very dark part of our country’s history. With every speech, rally, presentation, or comment, they continue to perpetuate the idea that the same heinous racism brought about by white Americans in the days of Jim Crow, is alive and well today. Very sadly, in many cases black children are brought up by parents who, like Eric Holder did with his son, ingrain in their children a certain fear of non-blacks, and of whites specifically. When we combine these statistics with the actions of men like Sharpton and Jackson, whose words do nothing but continue to unearth over and over again a tragedy that society and our nation in particular have moved far, far along to rectify, it’s not terribly hard to understand young black America’s distaste for white Americans . . . and the subsequent violent crimes perpetrated against them. Be it duly noted—none of these things justify the horribly racist and violent reactions to the Zimmerman outcome. Instead, they suggest a need for immediate action. As easy as it is to become frustrated and give up after being told over and over and over again that white America is inherently racist (believe me, I had just such a Twitter episode this week, and it’s not easy) we must resist the temptation to snap back. Instead, all Americans—white, black, Hispanic, Asian, Indian, and everything in between—should emulate the actions of people like Dr. Natalie Carroll, an obstetrician from Houston who encourages her single mother patients to marry, and promote the simplest of solutions: a stable family unit. Without fixing this dire problem, any other solution is altogether temporary. We must all hold our media and our elected officials accountable when they are not honest about the facts, and when they go out of their way to make things appear otherwise. Outlets like NBC must be held accountable their doctoring of the Zimmerman 911 call to purposely make Zimmerman look like a racist. Lastly, we must encourage people to leave behind the tired message of the world’s Al Sharptons, and instead accept the fact that while racism will never totally be eradicated from the world (and pockets of intense racists do exist, both here and globally), Jim Crow is no more. Instead of focusing entirely on the error of our past, let us instead focus on how we heal the problems truly facing us today. 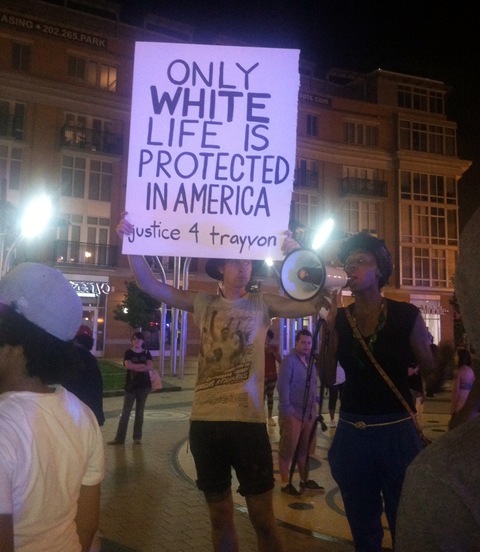 Thank you for those shocking facts about black on white violence in america. “Of the approximately 1,700,000 interracial crimes of violence involving blacks and whites, 90 percent are committed by blacks against whites. Blacks are 50 times more likely than whites to commit individual acts of interracial violence. They are up to 250 times more likely than whites to engage in multiple-offender or group interracial violence” This is the direct result of the racial, hate industry manufactured by the Democrat Party in our country. The liberal media is also guilty of the same manufacturing of hate by not reporting black on white crime, but always reporting white on black crime. Holder had to tell his son lies about white violence against blacks because where his son lives and goes to school that lie has no reality. But he and Obama must continue hate manufacturing to ensure their party’s political power. Don’t look at black violence against blacks, don’t look at black unemployment, or black education, just keep focused on manufactured white violence and stay on the progressive plantation for the next election. The media, the politicans and the NAACP are equally responsible for the uproar over the Zimmerman case. This trial should never have received the coverage it did. As you state, there are killings of African Americans all over the country in numbers that often exceed the casualties of war, and they aren’t covered as this trial was. It seems just another action to focus America’s attention on something other than the important issues facing our country. For the president to take a stand on this is absolutely ridiculous. The trial is over. George Zimmerman received an acquittal. Justice was served. Let’s get back to the reality of life and what’s really happening in our country.